Whether it’s because of the color or how it’s prepared, kids too often turn their noses up at the healthier parts of their meal. Fruits and vegetables are no exception. But September is about helping kids and their parents realize the great benefits that come from eating fruits and veggies. September is Fruits & Veggies – More Matters Month, a program started by Produce for Better Health Foundation, a non-profit organization that has partnered with the Centers for Disease Control and Prevention. Starting in 2011, when the USDA replaced the classic food pyramid with the Healthy MyPlate Icon, it recommended that half of your plate should be filled with fruits and vegetables. According to the USDA’s “Dietary Guidelines for Americans 2010,” more than 90 percent of adults and children don’t eat the amount of fruits and veggies recommended. Fresh, frozen, canned, dried and 100 percent juice all count towards your daily intake of fruits and veggies. Plus, the half-a-plate guideline makes it easier than having to measure out a serving of fruits and veggies; just load them up on your plate! Why Are Fruits & Veggies Important? Fruits and vegetables are major contributors of a number of nutrients that are under-consumed in the U.S., including vitamins A, C, K, potassium, fiber and magnesium. Fruits and vegetables are also associated with reduced risk of many chronic diseases and are low in calories, so they can replace high-calorie foods that might cause weight gain. Letting them pick fruits or veggies to put on your weekly menu. Help out at the grocery store in selecting fruits or veggies that look good. Letting them help measure when you’re preparing a meal. If they’re old enough, show them how to properly use a knife for slicing carrots, cucumbers, or anything else that’s easy enough for a child to help with. 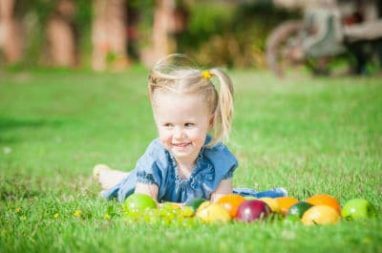 Giving your kids an opportunity to be involved and have hands-on experiences with fruits and veggies can help make a big difference in how much they enjoy eating them. Fruits and veggies aren’t just healthy, they are a quick and easy snack to grab out of the fridge when you’re on the go. According to survey results released by the market research firm NPD Group, the popularity of serving cookies as a children’s snack is on the decline. Fruit is now the no. 1 snack item parents give to children under age 6. Researchers believe that parents are taking childhood nutrition more seriously. Here at Wheels For Wishes, we certainly hope all kids stay healthy. Unfortunately, that isn’t always the case. Many children are battling critical illnesses and are unable to get involved in the same activities that other kids are involved in. When you donate a car to Wheels For Wishes, the car donation program benefiting Make-A-Wish, you can help to grant a wish for a child in your community who is battling a critical illness. Your car donation helps fulfill a child’s life with hope, strength, and joy. Donate a car and help to grant wishes for children between the ages of 2 ½ and 18. To donate a car, truck, boat, motorcycle, or camper, please call 1-877-431-9474 or take a moment to fill out our online car donation form. Your donation makes a difference!